Climate change is one of the most critical global challenges of our time. This factor, coupled with the increasing demand our society makes on energy and resources, has forced sustainable development to the top of the European political agenda. Scientific research has shown that also the cultural heritage of Europe is particularly vulnerable to these factors making its preservation and conservation a high priority to all stakeholders. Therefore, more effective and efficient sustainable adaptation and mitigation strategies need to be developed in order to preserve these invaluable cultural assets for the long-term future since they represent a non-renewable resource of intrinsic importance to our European identity. More reliable assessments of the impact of climate change will lead to better prediction models, which in turn will enable preventive measures to be taken, thus reducing the consumption of energy and resources. Against this background, the CLIMATE FOR CULTURE project estimates the impacts of changing climate conditions on historic buildings and their vast collections in Europe and the Mediterranean. A multidisciplinary research team of 27 partners aims to identify the damage potential of our cultural heritage most at risk, so as to encourage the development of strategies to mitigate the effects of climate change, including through policy makers and the Intergovernmental Panel on Climate Change (IPCC) reports. Furthermore, the project provides insight into the possible socio-economic impact of climate change, given the importance of cultural heritage to Europe’s economy. 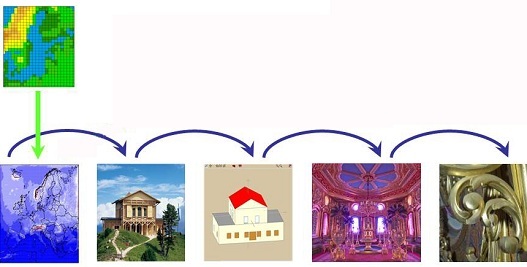 The main innovation of the project is to use simulation and modelling tools to better predict the influence of the changing outdoor climate on the microclimate in historic buildings until 2100, and to assess the damage potential of these future microclimates on art collections in various climate zones. For the first time ever, regional climate models with a high resolution of 10x10 km are therefore being developed and coupled with whole building simulation tools to identify the most urgent risks for specific regions. Buildings of outstanding significance are subject to in depth case studies providing knowledge on the state of preservation, interpretation of indoor climate conditions and requirements from a preventive conservation point of view. Various types of historic buildings located in different climate zones and from different time periods are investigated concerning the behaviour due to weather changes and different utilization. The aim is an improved assessment of the climatic functioning of historic buildings and their future energy demand using whole building simulation with regard to the dangers for the interior equipment or works of art and resulting measures to improve conditions. For these research tasks, the newest available technology from European projects (AMECP, LASERACT, Noah's Ark, Friendly Heating, EUROCARE EU-1383 PREVENT, OnSiteforMasonry, SMooHS) are applied. The CLIMATE FOR CULTURE project is funded by the European Commission from 2009 until 2014.